"WBC objects on the basis that it has not been demonstrated that the proposal will not have a detrimental effect on key infrastructure and facilities within the borough.... advise SHBC that WBC is NOT satisfied that there is a robust, Very Special Circumstances etc. [case], is NOT satisfied as to the impacts on local highways, schools, noise, environment, air quality, flooding, drainage, maintaining the Thames Basin Heaths Special Protection Area, and is NOT satisfied about the impact on Horsell Common and local ecology." This was put to the meeting, and passed nem con. The main basis for rejection was the lack of sufficient information, rather than objection in principle. One councillor said she agreed with the objection because the proposed housing density wasn’t enough; she said WBC require 30-60, whereas the FGVL plan was ‘only 25’. She quoted the Council for the Protection of Rural England in support of this. Surrey Heath Borough Council is the planning authority for Fairoaks Airport and they will decide its future. We’ve prepared a draft email that you can send to show the leader that you support Fairoaks Airport. Feel free to copy & paste the text below into your email to each council. 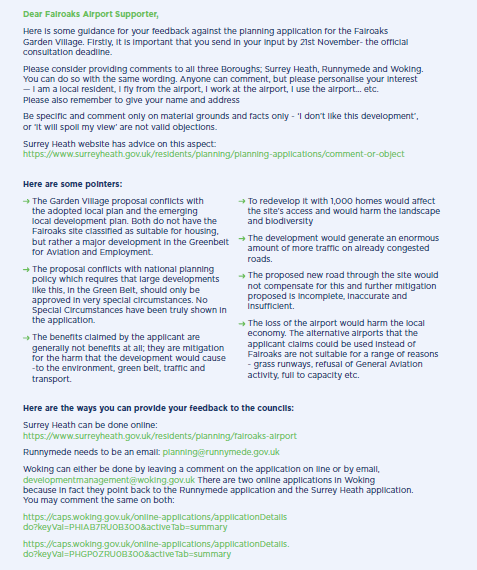 You may also wish to send a similar email to Runnymede Borough Council who are also involved in the proposed development. You can contact their council leader using the details below. Fairoaks Airport is an asset that Surrey Heath Borough Council should cherish and promote. It has been operational since 1937, training hundreds of civilian pilots each year and is an important base for emergency medical flights – 152 in 2016 alone. It supports over 300 skilled jobs in the local economy. Fairoaks Airport is a vital link in the national General Aviation network – worth £3 billion to the UK economy each year. Fairoaks Airport is also part of our precious Green Belt and 23 species of rare wildlife currently co-exist within the airport boundary. Developing the airport site for housing will put these creatures at risk. Any development will not provide housing for those who need it most – these will be executive houses in the countryside. They are the wrong houses in the wrong location. The extra traffic caused by 1,500 new homes will clog our already over-crowded roads completely. I am not opposed to developing new homes, however, in a four square-mile area around the airport, nearly 9,000 homes have already received or are due to receive planning permission. Fairoaks is the wrong place for even more. I therefore call on you to urge Surrey Heath Borough Council to reject any plans to develop Fairoaks Airport for housing. The campaign receives coverage in the September issue of the General Aviation magazine Pilot. The ownership of Fairoaks Airport is one of the confounding issues behind the proposals for Fairoaks New Town. To understand the situation we find ourselves in today, it is useful to know something about the airfield's history leading up to the new town development proposals and the interests that are driving them. 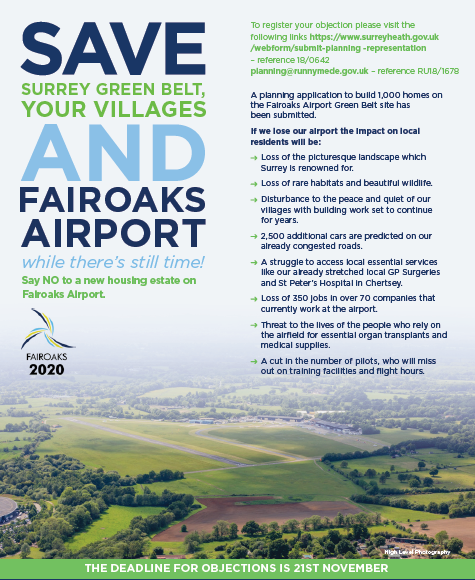 With the owners of the airport prepared to spend hundreds of thousands of pounds to persuade the Council to accept their plans – they have already employed a PR agency and a firm of architects – Fairoaks2020 needs your support today. We urgently need to raise £100,000. This will help pay for legal advice from the country’s top aviation lawyer and to continue our campaign of engagement with key decision makers in central government, Surrey Heath and elsewhere. We need our local MPs, all 41 Borough Councillors, and very many local and county-wide voluntary groups and organisations to understand the strength of feeling about the Fairoaks housing estate proposals. We have established an overall target of £250,000 for the next 18 months – typical of the funding other airfields that have recently been saved have needed. We are very grateful for any donation you are able to make to support our cause. Any funds remaining at the end of our campaign will be donated equally to Aerobility and the Chobham Church Tower Restoration Fund. Email donations@nofairoaksnewtown.org for our details or to discuss making a donation. The first flights in and out of Fairoaks took place in 1934 when it was used as a landing strip by a private owner who sold his farm to the Secretary of State for Air (Air Ministry) in 1936. 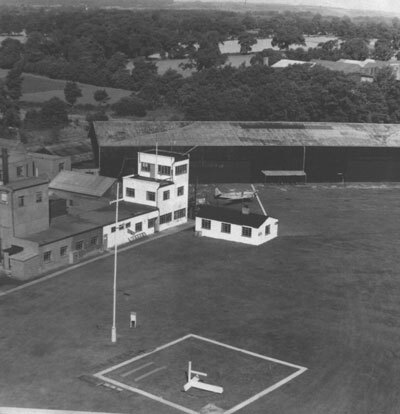 In June 1937, the Air Ministry announced that they would be setting up a flying school at Fairoaks for the training of new pilots enlisted in the RAF under an expansion scheme. The School was opened on 2 October 1937 by General Aircraft Limited who had been selected by the Air Ministry to manage the school. The School was one of nine new schools and commenced training, initially with three flying instructors, 24 RAFVR pupils and 6 Tiger Moths. The School was closed in 1953 having trained over 6000 pilots. Fairoaks Airport enjoyed a busy and important return to civilian usage after the Second World War and continues to be of great significance to the international aviation community as well as the local community it serves. For information on historic aviation events, you can read Fifty Years of Flying Heritage by Historic England. The predicament at Fairoaks is not solely a local issue. It is also of national significance and is part of a wider issue for General Aviation in the UK. General Aviation airfields are under threat. The national housing shortage and the pressure on local councils to deliver their Local Plans by March 2018 place severe pressure on airfields to justify their value, both to their owners and to local authorities, who are eyeing many of them as ideal sites for much-needed housing. In contrast, nationally, the Government has a vision for the UK as “the best place in the world for GA as a flourishing, wealth generating and job producing sector of the economy” - Department for Transport’s General Aviation Strategy, 2015. 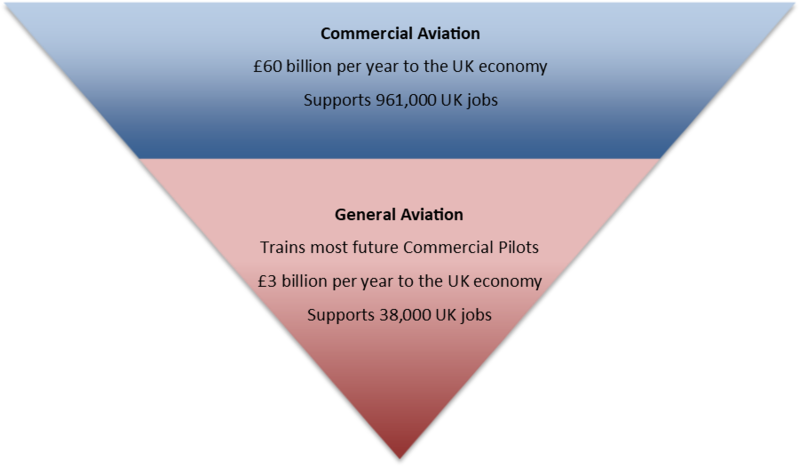 The General Aviation sector contributes more than £3 billion per year to the UK economy and supports 38,000 jobs in the UK. Through the training of new pilots at flight schools at GA airfields, it supports the larger Commercial Aviation Sector, which contributes £60 billion per year to the UK economy and 961,000 jobs. Airfields require a significant acreage of land and, as land is in high demand, there have been no new GA airfields built since the Second World War. This means that every time a GA airfield is closed and re-developed, there are fewer airfields at which to land. This is a particular issue in the case of an emergency - an emergency landing at an airfield greatly increases the survival rate of both the pilot and the plane and is greatly preferable to an emergency landing in a field, or worse in a built-up area. Therefore, a Minimum Viable Strategic Network of GA airfields is essential from a safety critical standpoint.